O God of the prophets, you opened the eyes of your servant Dominic to perceive a famine of hearing the word of the Lord, and moved him, and those he drew about him, to satisfy that hunger with sound preaching and fervent devotion: Make your church, dear Lord, in this and every age, attentive to the hungers of the world, and quick to respond in love to those who are perishing; through Jesus Christ our Lord, who lives and reigns with you and the Holy Spirit, one God, for ever and ever. Amen. St. Dominic, born Domingo Félix de Guzmán, was a Roman Catholic Priest and Friar. Upon his ordination to the priesthood in 1196, he because the canon and then, sub-prior of a french cathedral order. While sub-prior, he instilled strict rules for those in his care. As time went on, he traveled and preached in France. He also grew close to St. Francis of Assisi. 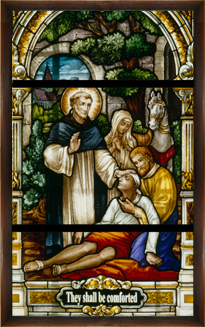 Due in part of St. Francis’ encouragement, St. Dominic petitioned and eventually awarded the authority to establish an “order of preachers.” He traveled all over, establishing friaries, training and teaching others to preach against heresy. St. Dominic and the Dominican Order emphasized preaching, education, learning, and due in part to St. Francis, poverty. The Order of Preachers is among the worlds largest religious orders with both Roman Catholic and Anglican streams. When I was a Baptist, the Dominicans really interested me. This was due in part to the practice of preaching being emphasized in that faith tradition. Since Roman Catholics had the reputation of being bad preachers, I was impressed to know that this order existed. I would wonder what their relationship was in relation to the Jesuits due to my experience of Jesuits being the best Roman Catholic preachers I heard at the time. The Black Friars, as they are called in my beloved Anglican Church, are really respected. I have communicated with the Anglican Order of Preachers and debated joining. After much prayer, at this time, its not in cards. I do admire St. Dominic and the emphasis on preaching, education, and poverty. These are aspects of the priesthood that I do hold dear. These are aspects of the priesthood that sometimes get lost. I am proud to say that the vast majority of my brother priests, especially in my diocese, emphasis these aspects.